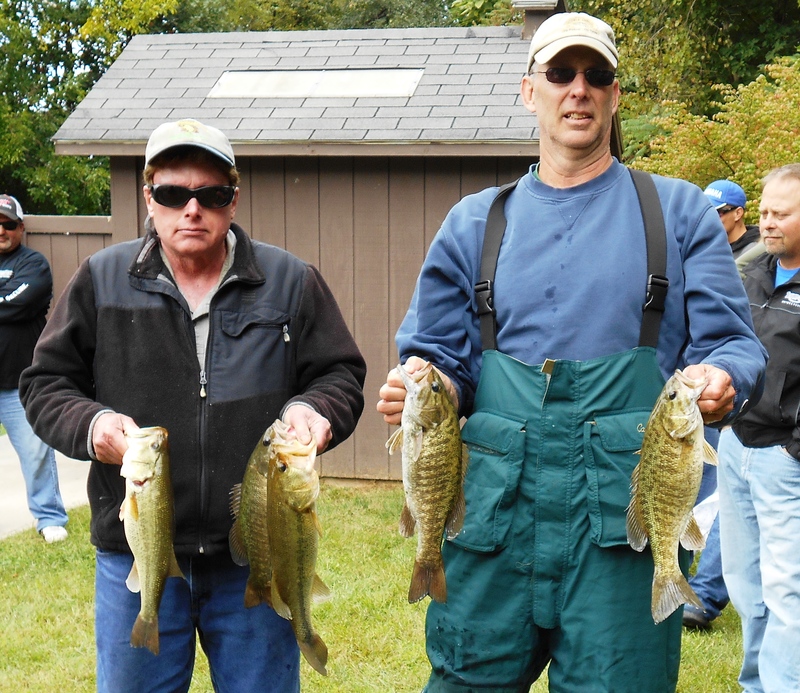 1st Place: In just two seasons, the team of Ron Fabiszak and Ron Nelson have won five R & B Bass Circuit tournaments. To put that in perspective, the next closest are the 2013 Season Champions, Greg Mangus and Kevin Fletcher, who have won three in four seasons. Fabiszak and Nelson have catapulted their way up the All-Time Money list as well, now ranked second. However, the most dynamic aspect in all of this, of the 13 tournaments they have participated, only 6 times were they partnered up together; the rest being either solo or with substitutes. Thus it is no surprise they won at Diamond when they were together just the third time this year. Their 11.87 pounds beat the closest competitor by 2.01 pounds. 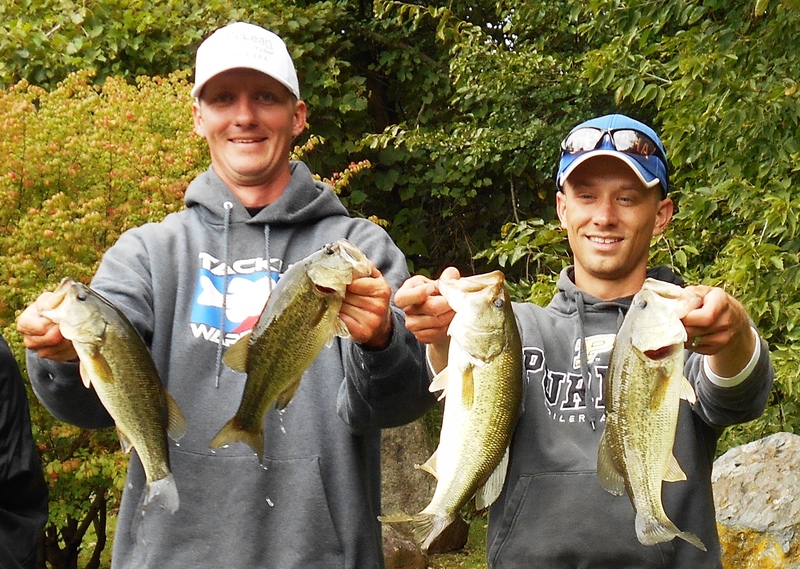 The victory netted them $745, but they also scored the Money Mouth Baits Big Bass, a 3.50 pound largemouth, which earned them another $350. In all, they took home $1,095. Ironically, the team developed a pattern in deep water three days prior to the tournament but spent the tournament between 2-4 feet of water. Fabiszak explained, “We began shallow, hoping to find some active fish. We did and never ventured out because the bite stayed consistent.” They also saw several bigger fish in the shallows and both took a turn at hooking and then losing a 4+ pound fish. The winners had their limit by 9:00 and their best five by 10:30. They failed to cull up after that, but continued to land keepers, 12 total. 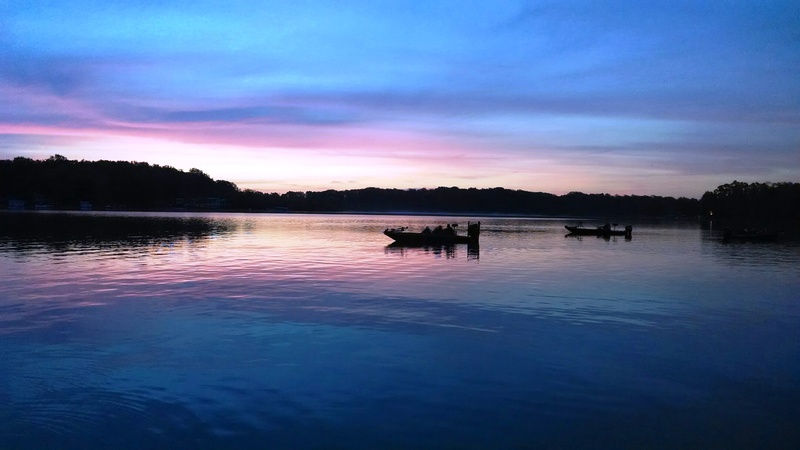 All of their fish were caught with ⅜ ounce Poor Boy’s Baits finesse jigs. 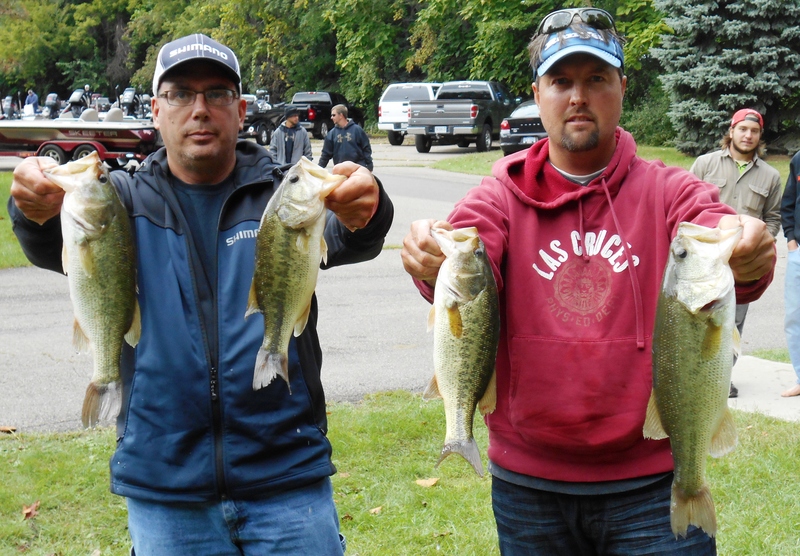 2nd Place: Rick Thatcher and Stan Bebout had a great rookie season with the R & B Bass Circuit. They scored a check in four events, finished in fourth place overall, and saved their best finish for last. Their 9.86 pound limit won them $472. “I practiced four times,” revealed Thatcher. “During practice, we got them on drop shots and Poor Boy’s Erie Darters, but the tournament was totally different. 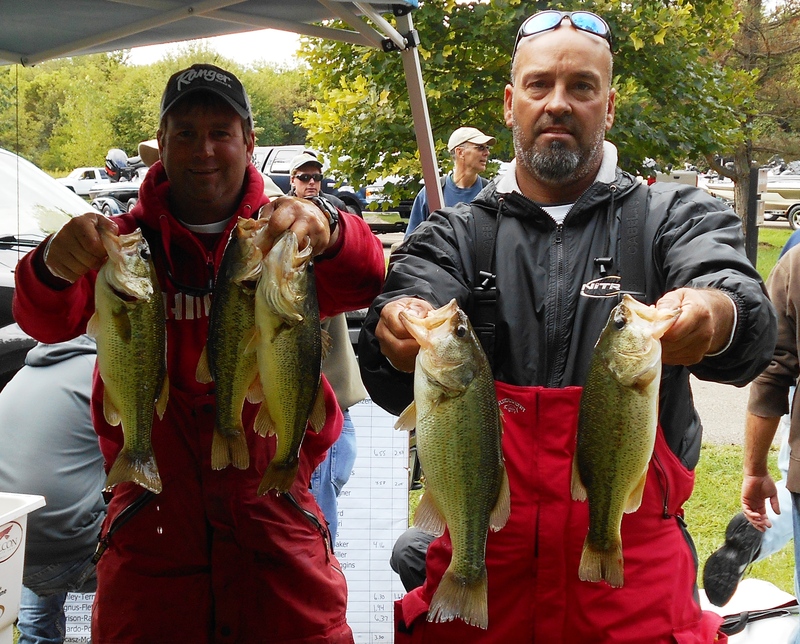 We could only get them to go on tubes during the tournament.” They matched their tubes with ¼ ounce jigs. 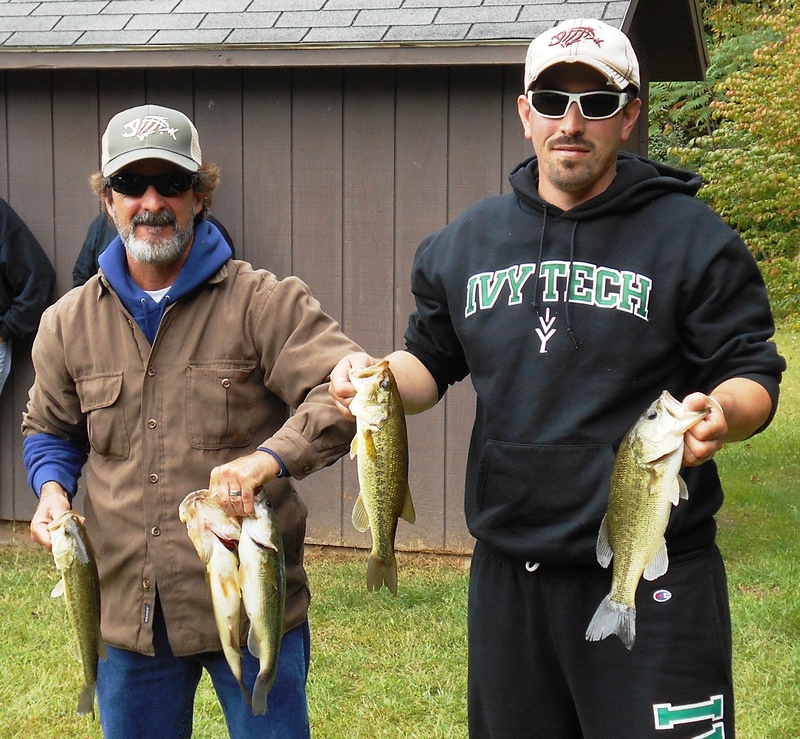 They caught eight keepers total from two spots on opposite ends of the lake. Many similarities existed between those two spots: four keepers came from each, were between 15-17 feet deep, and had scattered weeds. “It was important to hit the points of the weedlines,” Thatcher shared. However, at 10:00 on tournament day, their livewells were still empty and they were forced to scramble. They boated keepers on a drop shot rig, crankbaits, under docks, and even sight fished a few, “Just as I did on Austin [in 2013],” Gipson said. Scrambling around won them $348. “The second half of the day was much better than the first,” admitted Paulus. “We did not have a keeper until 10:30.” Plans A, B, C, and D all failed before settling in an area between 17-20 feet of water. Here they slung green pumpkin Poor Boy’s Erie Darters on ¼ jigheads. After a couple of hours their school of fish moved, but they were able to relocate it with their electronics just 50 feet away. Once they found them, the catch continued. Their persistence was awarded with an 8.50 pound limit and $248. It was then that they discovered two areas between 17-20 feet deep that contained sparse weeds and sand. Here the fish responded well to drop shot rigs and tubes. During the tournament they “hop-scotched” from one spot to the next. 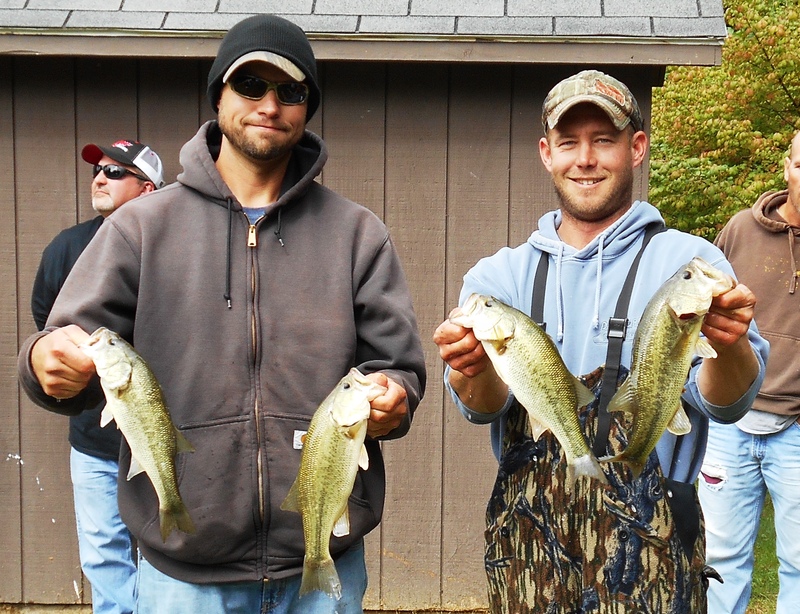 They only landed four keepers, but they averaged two pounds. 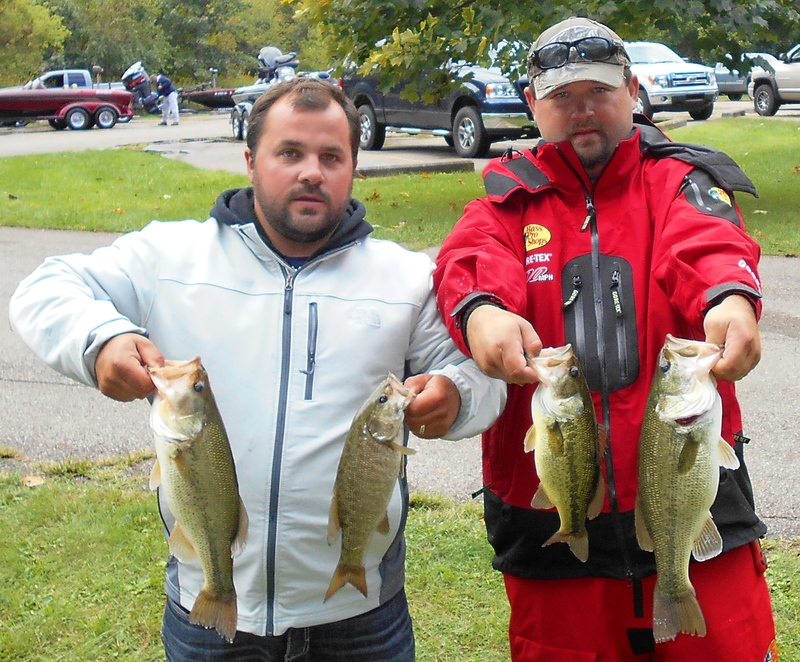 An 8.02 pound bag of fish won them $199 and gave them confidence heading into the classic, where Lisenko has scored a Top 5 in 2012 and 2013. 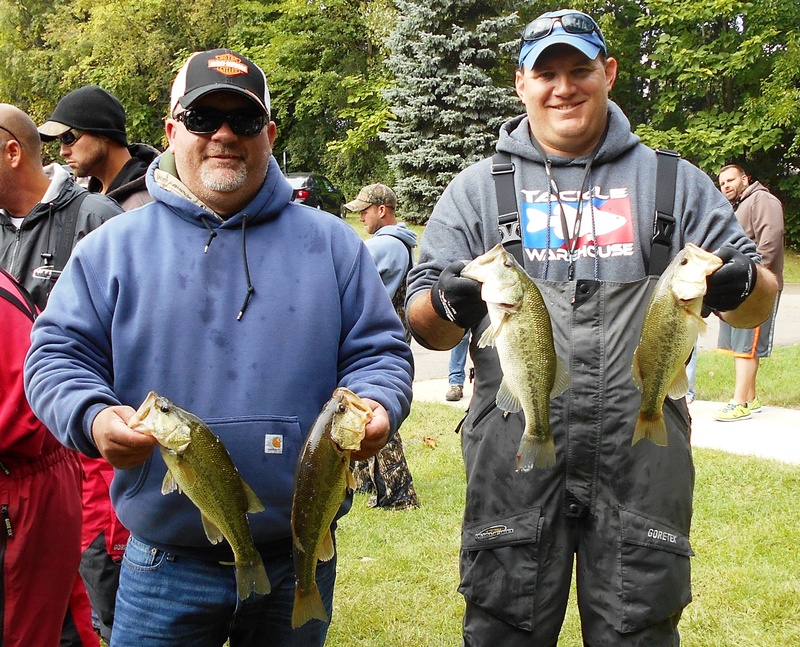 6th Place: Scott Sizemore and Mitch Bair had their best finish on the season with an 8.02 pound limit to win $174. 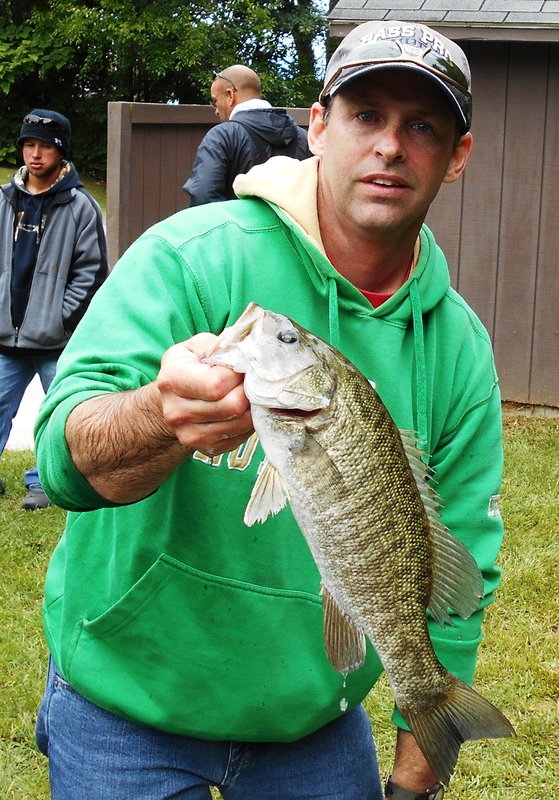 7th Place: Kevin Fletcher teamed up with "Super Sub" Ken Tucker and landed a 7.94 pound limit. They won $124. 8th Place: Also notching their best finish of the season was William Thompson and Charles Leader. Their 7.93 pound limit scored them $99. 9th Place: A 6.55 pound sack of fish did more than win Mike Klavinski and Bear Griva$75, it secured their hold in the Standings, crowning them the 2014 Season Champions. They overcame considerable odds as highlighted in "What's At Stake." 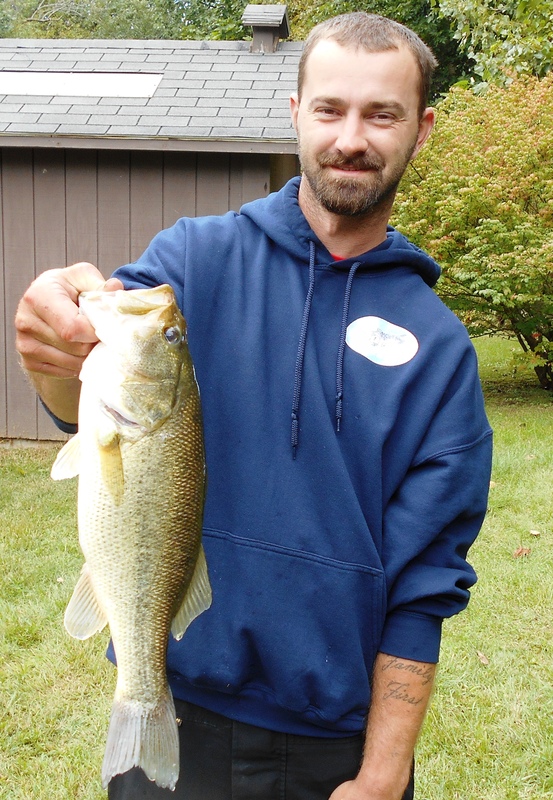 Second Big Bass: A 3.14 pound largemouth put $94 in the pockets of Frank Adams and Don Miles. 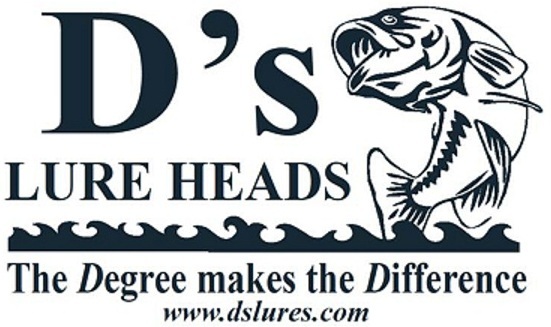 D's Lures Award: Despite fishing solo, Steve Januchowski earned gear provided by D's Lures by weighing 6.40 pounds. 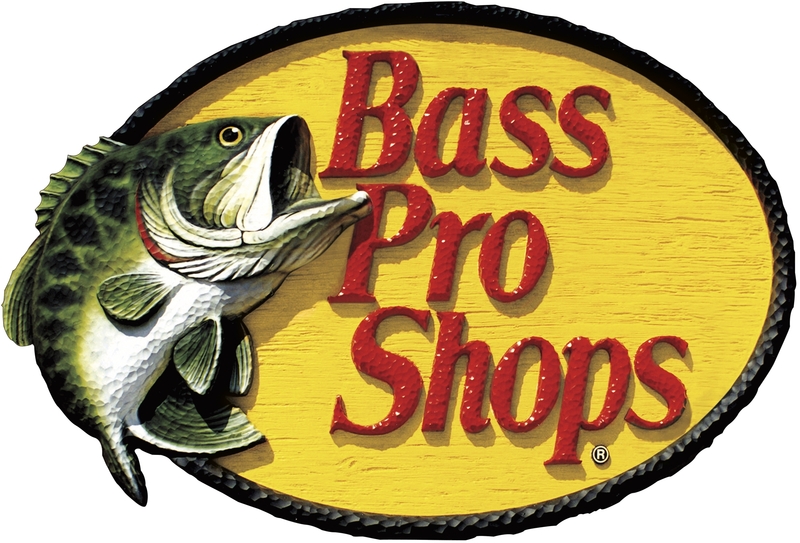 Bass Pro Shops Award: Kelly and Kevin Warner finished 15th place with 5.72 pounds and won an Extreme reel provided by the BPS store in Portage, Indiana. 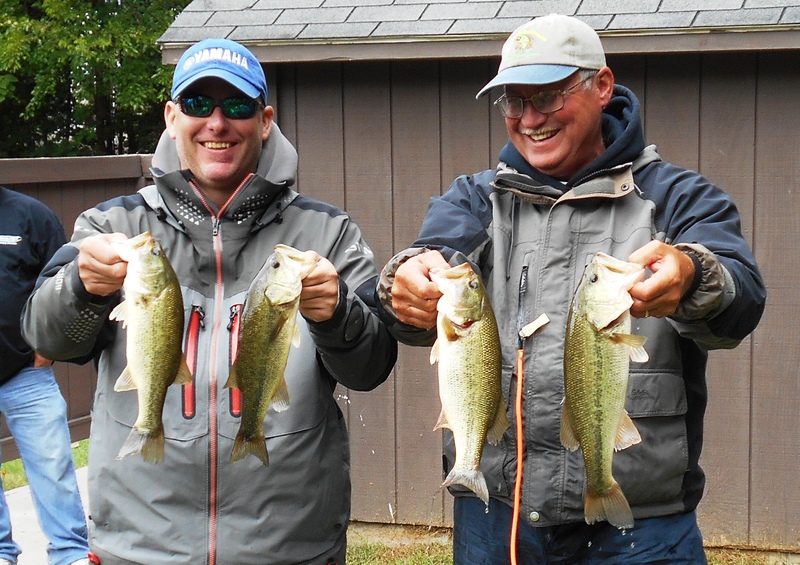 Solar Bat Sunglasses Incentive: Finishing in 20th place with 4.74 pounds, Steve Culler and Gene Worden qualified for the Solar Bat Incentive worth $100 in cash. Make sure you are qualified! 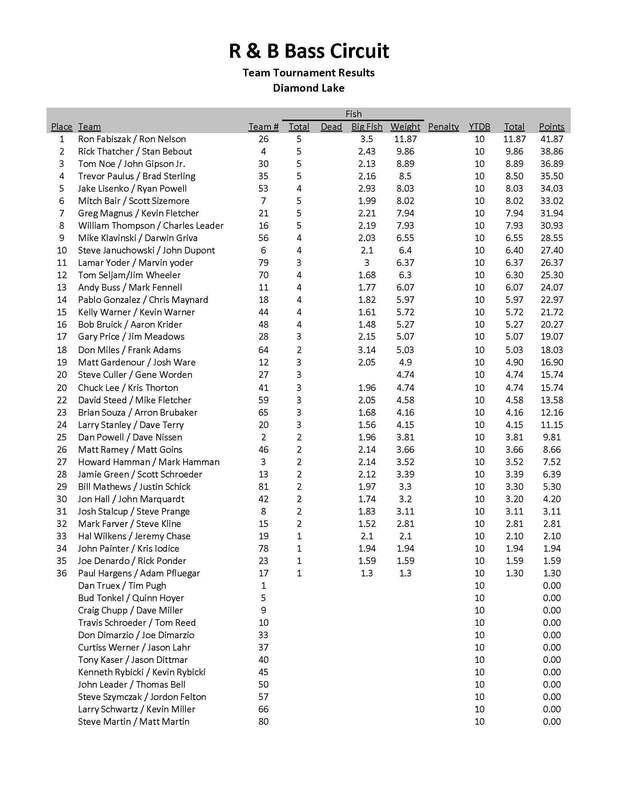 Starboard Choice Marine Challenge: With 4.16 pounds and a 23rd place finish, Brian Souza and Aaron Brubaker are eligible for a prize worth $90. Always adamant about making sure every child leaves an R & B tournament with something, Humminbird teamed up with us this year by providing hats. So nearly 20 have been given away. The youngest yet, though was Tom Noe's two month old child. He now has his first fishing hat. 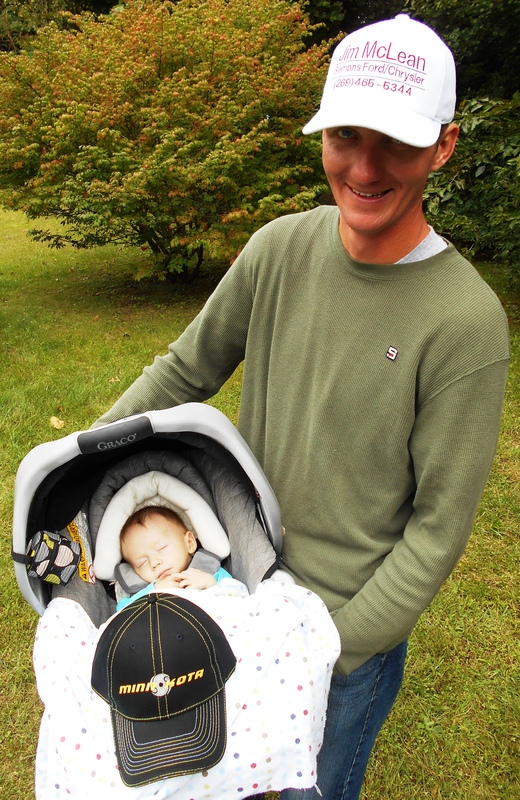 Above, Kris Thornton poses with his son.